This recipe was posted on the wrapping of a Calphalon baking sheet, which I purchased for a family member. 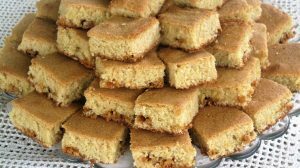 Since I never made Blondie Bars before, I was eager to give this recipe a try, and was very pleased with the finished product. Line bottom of 12 x 17 inch baking sheet with parchment paper. Reduce speed to low, and mix in the eggs, one at a time, until fully incorporated. Sift flour, baking powder and salt, into a bowl. Gradually add dry ingredients and mix on low, scraping bowl as needed,until completely incorporated. Turn off mixer and fold in butterscotch chips. Spread better evenly in the baking pan. Remove from oven and cool slightly before cutting into squares.